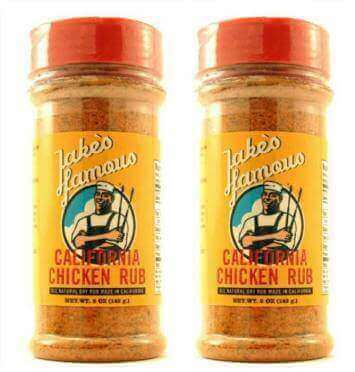 Jake's Famous California Chicken dry rub for sale is a wonderful blend of herbs and spices that can't wait to roast a chicken or make flavorful chicken wings. This BBQ Chicken Rub seasoning is built on a firm foundation of natural garlic, parsley, smoked salt, spices, chili powder, turmeric, and rich hints of brown sugar that make grilling quick and easy. The chicken seasoning is perfect for power basting and marinates deeply within 45 minutes to an hour. The rub can be left on for overnight marinating and will deliver a light smokiness and golden brown color to the meat. Because it's natural it will speed up the time necessary for marinating. There is No rubbing required unless you really need the exercise. After resting grill, pan fry or broil until done. Jake's natural BBQ chicken dry rub for sale is excellent for chicken, ribs, fish and more and is a wonder at lifting the flavors of bland meals. Better than seasoned salt and all the more natural get it today. At Jake's Famous Foods we guarantee you an exceptional barbecue experience. We promise to treat you like friends and family and to serve you our products that have been prepared with focus, uncompromising quality and our thorough standards. If you are not completely satisfied, just let us know, and we will honor our guarantee.